Der CM206 ist eine robuste wetterbeständige Traverse, die an einem Dreibein oder Mast angebracht werden kann. Er dient als Basis für einen Sensor. Der CM206 ist kompatibel mit allen unseren Dreibeinen CM10/X, CM110, CM115 , CM120 und UT-Türmen und den Halterungen der CM-Serie. Er kann auch an anderen Rundprofilen angebracht werden. The dark gray components are those included with the CM206. The lighter components are sold separately and demonstrate how the CM206 is used. The CM206 provides a rugged, weather-resistant sensor mount for one or two sensors. 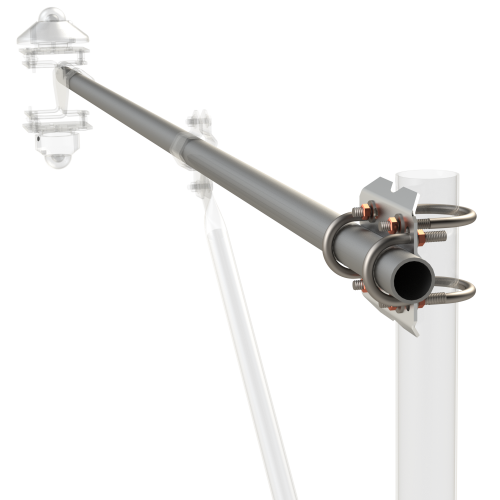 It consists of a 6-ft aluminum pipe and the CM210 mounting bracket kit. U-bolts included with the mounting bracket are used to attach the crossarm to a tripod mast, tower leg, or user-supplied vertical pipe (1.0” to 2.1” OD). All of our tripods and towers are compatible with the CM206. If the CM206 will be mounted on a tower, an additional CM210 bracket can be added so that the crossarm is secured to two of the three vertical risers within the tower.